According to American Association of Orthodontics children should visit an orthodontist by the time they are seven years old. Those children who wait until after the age of 10 have a harder time correcting growth irregularities. If a dentist decides that a child needs braces, the treatment process will begin. If your child has braces, it is necessary for them to brush their teeth at least three times a day, and to floss daily. To prevent bacteria buildup, which can lead to gum disease and cavities. You should schedule more frequent dental checkups for your child while they have braces. Our office has a professional orthodontist that can help give your children the beautiful smile they deserve. Some of the benefits of getting straighter, more aligned teeth include better speech, ease of brushing and flossing, prevention of tooth decay and gum disease and an improved image. To make braces an affordable option for your family, we offer financial assistance with zero interest payment plans. The only way to be sure that your child needs braces is by having a consultation with a trained orthodontist or pediatric dentist. By taking measurements of your child’s bite, the dentist can identify areas of crowding or spacing which needs to be corrected using braces. If My Child Has Baby Teeth, Is He Or She Too Young For Orthodontic Treatment? Although there is a general misconception that orthodontics can only be started after all of the baby teeth fall out, the truth is that a lot more can be done if the child has his or her consultation earlier. Since the bones are not fully formed before puberty, it may be easier to expand the bones and prevent future crowding using orthodontic appliances. In fact, early detection of many malocclusions can be treated with orthodontics in Jacksonville FL. 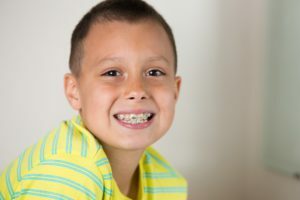 Since orthodontic treatment is custom tailored to the needs of each child, and not two children are alike, it is impossible to determine in advance how long braces will take. For more complicated malocclusions, children may need to wear braces from 6 months to 3 years. However, this time period can only be determined after the initial exam and throughout the course of treatment, depending on the rate of success with the appliances. It is impossible to determine the exact costs of braces until the orthodontist has determined how long the treatment will take. Nevertheless, to make the entire process more affordable, our office does offer zero interest payment plans and many other promotions. So come visit our orthodontic experts at Orthodontics and Dentistry for Kids to learn more about how you can get braces for your child. For more information on braces, and for other pediatric orthodontic inquiries contact us today.